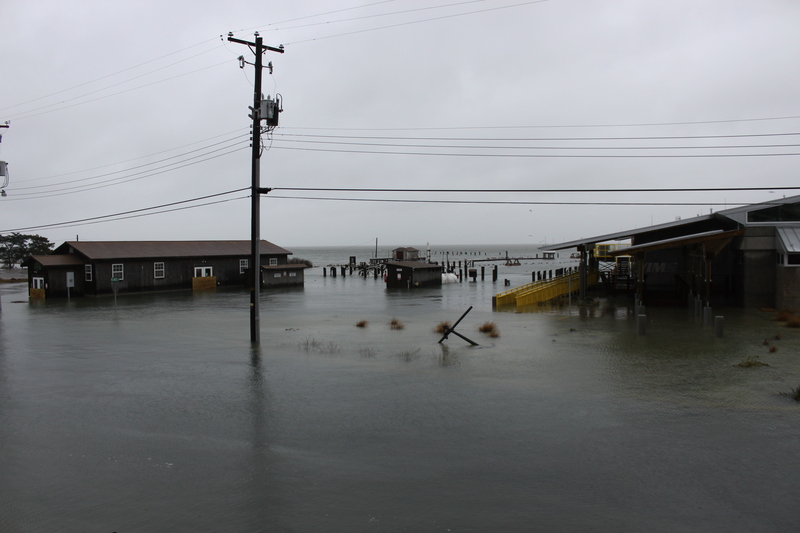 At 450 nautical miles, Hurricane Sandy is currently tied as the second largest storm on record. Right now she’s sitting off the Carolina coast delivering massive amounts on rain to Southern Fried Science HQ, but the real trouble is going to start in a two days, when she makes landfall somewhere between Maryland and New Jersey. Too all our East Coast readers, stay safe out there and keep watching the storm tracks. Feel free to use the comments thread to discuss the hurricane, ask hurricane safety and preparedness questions, or update everyone on the storm. UPDATE: The HMS Bounty, a 3-masted tall ship feature in the 1962 film Mutiny on the Bounty and more recently, Pirates of the Carribean Dead Man’s Chest, sunk of the coast off North Carolina. 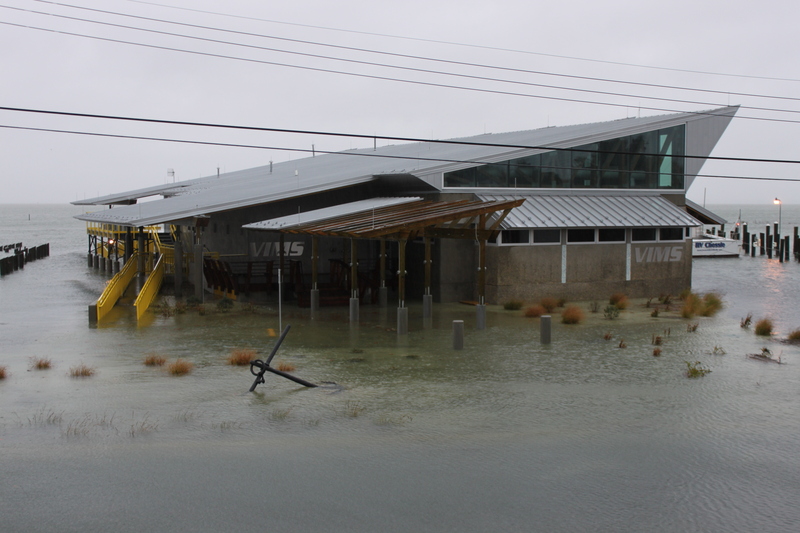 UPDATE: A colleague send images from the VIMS Eastern Shore Lab, showing several facilities swamped. VIMS Eastern Shore Lab. Photo by Mark Luckenbach. Reporting from the Washington DC area here… I’m thinking of all the news photos I have seen of people nailing plywood over their windows. How come the long list of preparations from my local agencies never tell me to nail plywood over my windows? Is this something you only need to do at the shore? And if so, why? I am not joking here. They have gotten me so terrified that I can hardly think straight. They told us to clear up our fallen leaves so they don’t clog the storm drains. Am I going to be sorry I was doing yard work instead of covering up all the exterior openings of my house? Images of people boarding up windows make good copy for the news reports. Plywood is good if you expect a lot of sustained wind and flying debris. The biggest worries in DC are probably flooding and power outages. Even down in NC on the coast, the plywood only comes up for Category 3 or higher (disclaimer, I do have double pane hurricane windows, so YMMV). I don’t think you should worry too much that you haven’t boarded up, but, as always, check with your local emergency responders (Fire or PD) to see what they advise. Thanks – as a sometime member of the media, I find that a comfortingly believable point. How did you fare? Not too much damage I hope.